Hello all, new member, first post! I just bought a used 2013 VT, 88k miles, 6 speed manual, well taken care of, clean car-fax. No known mods other than a K&N air filter element in stock housing with stock air intake. Driving home, car developed misfires, worse under hard acceleration. At steady speeds car ran fine, got 34 mpg on expressway trip home. After reading some posts, I changed the spark plugs due to mileage. It seemed to help at first, but misfires returned. Plugs removed had a bit of brown discoloration, but not burned, wet, caked with deposits or any damage to ground electrodes or porcelain. Gaps only slightly larger (maybe 0.035" max) than those on replacement plugs (0.028"-0.030", carefully checked with feeler guage, as I know from my 33 years in the auto parts business that re-gapping Iridium plugs can cause more problems than a few thou variance will) After reading some posts on here about possible coil pack and low-pressure side fuel supply line issues, I hooked up my scan tool. The only codes I have are for misfires, including all 4 individual cylinders (P0301-P0304) and P0300 random, no P0087 low fuel pressure, yet scan tool indicates only 560-580 psi fuel line pressure at idle, and it stays flat with a only a little variance up and down as rpm is increased to around 3500 in neutral (not gonna free-rev it higher than that). Not having much experience with Hyundai (if you need GM vehicle info, I'm your man,...) I humbly turn to you all for help and advice, so as to not throw away money on things not necessary. I ran my VIN on Hyundai's site, and it does not show any recalls or campaigns relevant to it. Thanks in advance for any and all help. Thanks for the reply. I will run my scanner tomorrow while driving, record fuel pressures under load and post back. So you're saying these cars do not like regular 87 octane even when stock even though the owners manual says it's okay? Okay, good to know I need to run better octane from here on out. Thank you for that info. I hooked up my scan tool this morning to watch the readings and record them, but for some reason the recording stopped only a few seconds after I started. Upon glancing at the readings as I continued to work, the fuel pressure moved around, generally between 560-1500 psi, with no misfiring issues under light load acceleration, keeping revs under 3500. The one time it spiked up a higher is when I rolled on the throttle in 6th gear around 45mph. Under that load, the pressure spiked to around 1950-1960 psi, and the engine stuttered, but it didn't trip a permanent misfire code. Does this still sound like bad coils or possibly a fuel delivery issue? Hmm, interesting. The "up-shift indicator" starts nagging if I don't shift to 6th at that speed while steady cruising on flat ground. To clarify, all I did was slightly roll on the throttle to induce a load once I reached a steady speed. That is when the hesitation occurred. It was not a typical "lugging the engine"
in too high of a gear feel. No attempt at hard acceleration. Again, I really appreciate any and all responses. So, what information do I need to provide to try and narrow this down? Do I need to more closely monitor fuel rail pressure readings vs rpm and post them here? If so, I will try to get the record function to work on my scan tool so I can do so more accurately. I can say that fuel pressure under normal acceleration stayed under 1300 psi. Do I need to get on it a bit and get the tach above 4k and see what happens then? It only spiked into the 1900's when I lightly rolled on the throttle (not hard enough to physically lug the engine) in high gear and that's when the hesitation occurred. I've read fuel rail pressures in the >2k psi range under load are not abnormal. Is that information erroneous as well? Is there an ohm spec for the primary side of the coils that I can test, or is that not an accurate test due to the coil-on-plug design? You should see ~2150-2175 PSI (~148-150 bar) at WOT. 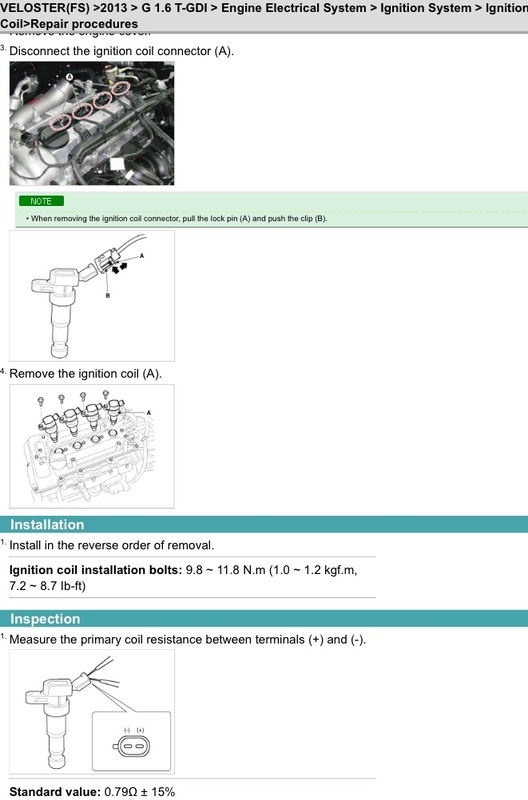 Ignition coil resistance specs are in the service manual. Last edited by E9C900A; 03-25-2019 at 01:45 PM.